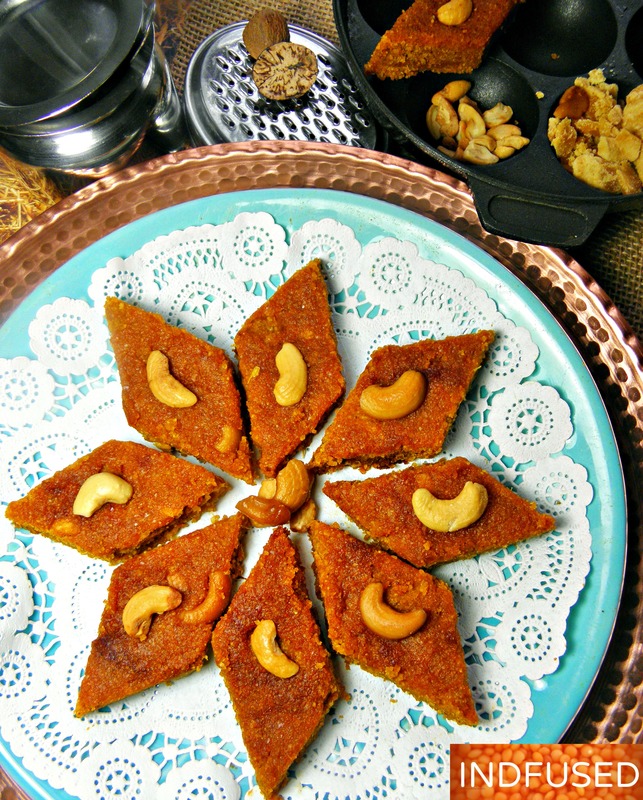 Another sweet for Navratri with a wholesome,earthy flavor and an enticing autumn aroma! An Indian fusion recipe that combines two classics-the classic pumpkin flavor of fall and the Konkani dhondas-a very earthy, homey flavor perfect for Navratri, a festival that also celebrates the wonders of Mother Earth. 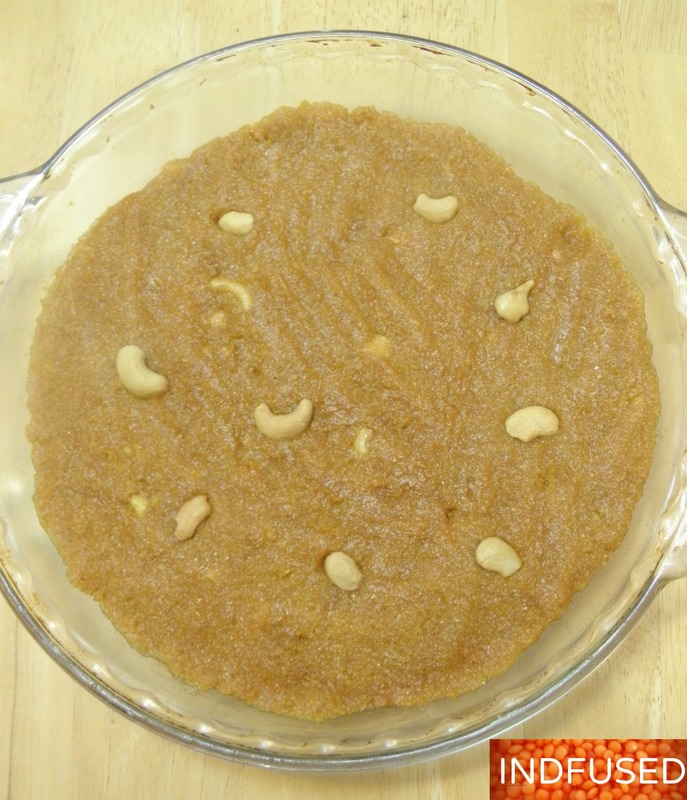 Dhondas is a very unique, sweet, eggless cake in Malvani cuisine and in the coastal areas along Maharashtra, Goa and Karnataka. It is typically made with grated cucumber and combines my favorite flavors – jaggery, grated coconut, cashew nuts and nutmeg. Rice that is washed, drained, dried and coarsely ground, is used to make dhondas. My take on this classic is to combine the earthy flavor of pumpkin with jaggery, coconut and nutmeg. In the interest of saving time, (you know I am always looking for shortcuts:), I used idli rawa, which is parboiled rice, made into cream of rice. It passed the taste test with some folk who only like ‘authentic Malvani cuisine ’. The combination of the pumpkin, jaggery and coconut laced with the nutmeg deepens as it bakes, making this Pumpkin Dhondas a rich and flavorful dessert. This recipe is very easy to make. 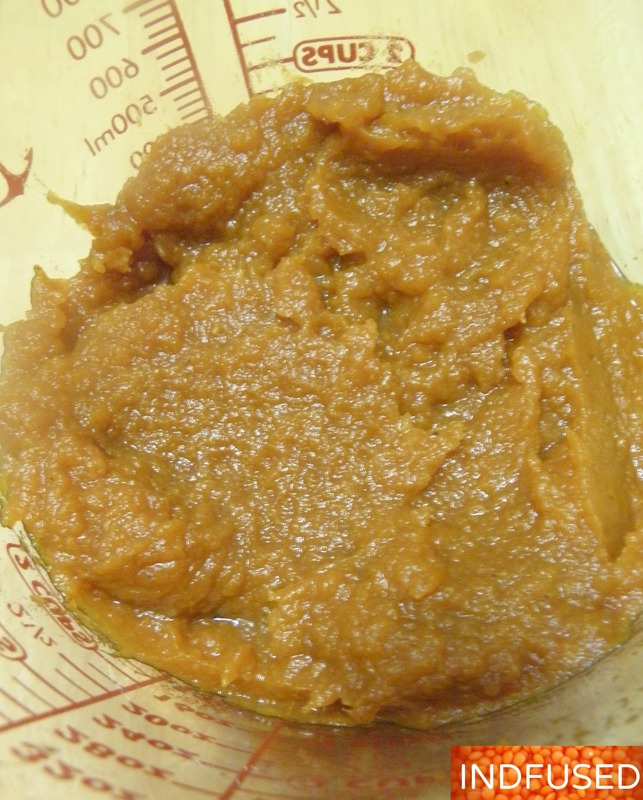 I combined pumpkin puree with jaggery and microwaved it for 2 minutes on high. This helps dissolve the jaggery. Pour the batter in a pie plate greased with ghee. Preheat the oven to 350 degrees Fahrenheit. Bake the dhondas for 45 minutes or until golden brown. Alternately, you can pour the batter in an aape pan and cook on low on the stove top, covered, for about 5 minutes or until golden brown and cooked through. Microwave the pumpkin puree on high for 5 minutes to concentrate the flavor. It will yield about 1 ¼ cups of pumpkin puree. 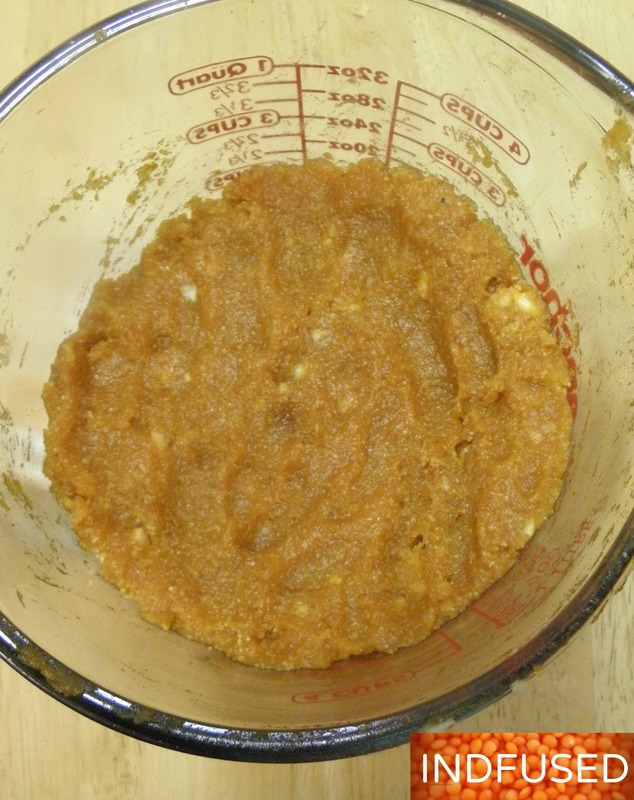 Add the jaggery, mix and microwave for 2 more minutes. Add the nutmeg, coconut, cashew nuts and salt. Mix well. Combine the idli rawa and the baking soda and add to the mixture. Mix well. Pour the batter in a pie dish greased with ghee. Bake in a preheated 350 degree oven for 45 minutes or until golden brown and cooked through. Relish the homey flavors of fall with this sweet, eggless and glutenfree cake! I’m sure I would love that! Thanks Greg. My husband and I liked it a lot. 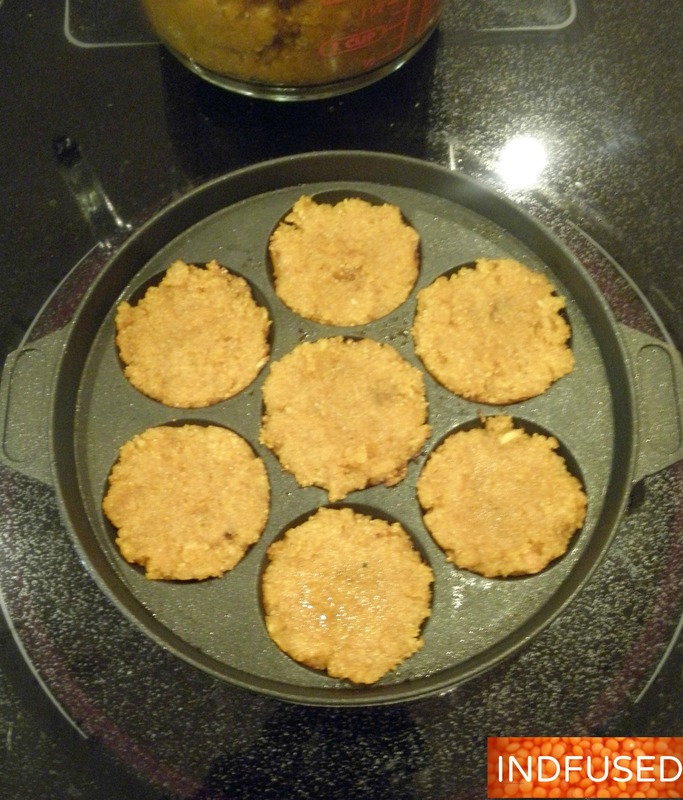 Adding coconut to sweeten and add texture is so brilliant, Sandhya! I like the spices you chose, too. Pumpkin in this flourless cakes would be delicious, dear. Your recipes are always so simple and innovative, Sandhya. 🙂 Pumpkin is one of my favourite vegetables and this looks so enticing. Sandhya, I plan to try this and make it as ‘prasad’ for this festival season! A healthy sweet. Thank you. I love how you always keep inventing Sandhya. Looks delicious. Ana, I experiment too much:) Luckily my husband loved this recipe! This looks so delicious! I love the addition of the pumpkin! Thank you Antonia! This is my husband’s favorite dessert now. Thank you so much Antonia! I will check it out soon. Thank you so much Antonia! I am so honored. Thank you Linda! You made my day! sounds delicious–good for Thanksgiving, too. Thank you. I was thinking of that too. It tastes really great and is a gluten free option. how creative! love the cultural infusion! This looks amazing! I love anything pumpkin and this recipe is so different than anything I have ever seen! Can’t wait to try it. Thank you so much Chrissa. We loved it a lot and a now realizing that it could be one of my gluten free, egg-less desserts for Thanksgiving too! Loretta, Welcome back! I have missed you. As for the pumpkin puree,I took the shortcut too. I got a can that said all natural, unsweetened. I forget the company. The other option i use sometimes for a savory stew is to get the frozen bag of peeled and cooked squash.